Welcome to Seagull Fishing Tackle Dungeness. Dungeness is a magical place, a fishing location second to none. 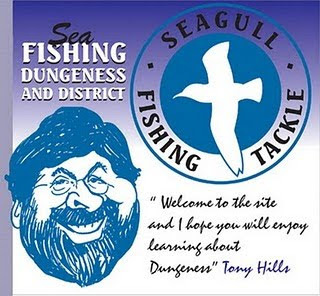 So if you fancy fishing Dungeness and District, welcome to Seagull Fishing Tackle. We are located at Greatstone-on-Sea five minutes down the bay from Dungeness. We are a small friendly traditional shop committed to fishing at Dungeness. Open three days a week for the winter (it pays to phone) we have a good local knowledge which we like to share of the best fishing spots in the area. We stock tackle and bait; suited for fishing at Dungeness. We welcome everybody, the seasoned expert, the novice with no previous sea fishing experience, we all have to start somewhere! At Seagull we pride ourselves in selling the best bait available, including fresh, locally dug black lugworm and as well as live ragworm. We also stock the complete range of frozen baits from Ammo (I consider their frozen products to be the best available) if you need advice on what to use around Dungeness and how to present it just ask. Dungeness is one of the best sea fishing venues in the UK and our shop is ideally located, only a 5 minute drive away.....So welcome to our world!